No matter what establishment you operate, we have the napkin to suit, coffee stands or coffee shops, gastropub to bistro's, fine dining and takeaway. 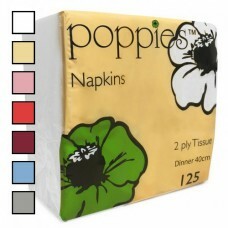 The right napkin can add to the ambience of your restaurant and table setting. Prefolded for ease of table setting, dispenser napkins for speed and easy access at deli's and food counters in a wide selection of colours. 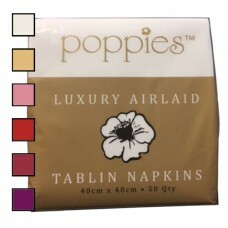 Table covers to protect and enhance your table setting and in colours and strength to match your napkin. 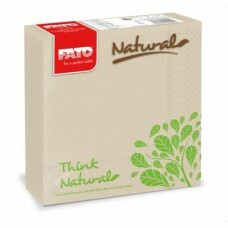 We also stock an Eco Natural range for those wishing to enhance our environment. All food contact certified on request. 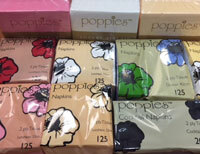 Printed napkins with your company logo or name are also available on all our napkins, please contact the office for further details, minimum order quantities apply and a lead time of approx 4 weeks subject to change. 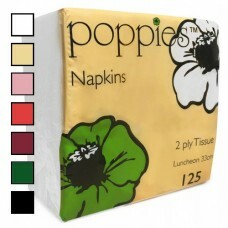 Lucart Professional Eco Natural Range is a new innovation in promoting a green agenda in the caterin..
We stock the Poppies brand of napkin, they are a quality paper napkin available in a range of colour..
Poppies luxury airlaid napkins are available in a range of colours to enhance your table setting,&nb..